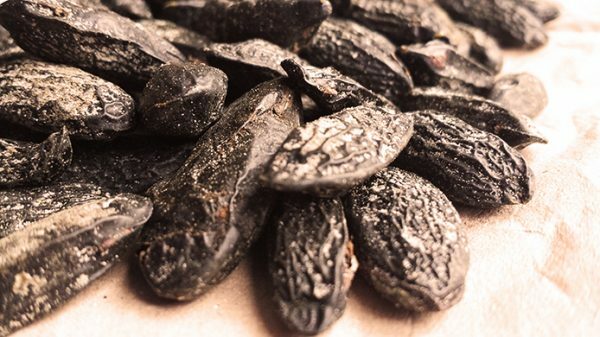 Arctander has this to say “Tonka bean absolute is a semi-solid or crystalline mass of pale amber or pale brownish-yellow color. Its odor is very rich, sweet and warm, distinctly coumarinic-herbaceous, with a prune-like or carmellic-sweet undertone. The absolute consists of from 20 to 45% coumarin, but the effect of a true tonka absolute goes far beyond that of the coumarin contained in the absolute. In this fact lies the explanation for the continuous use of tonka absolute today, almost after a century after the appearance of synthetic coumarin on the perfume and flavour market. The large seeds which are known as tonka beans are solvent extracted, the colour is sandy beige and of a very thick to solid consistency. If you submerge the bottle in hot water the material will eventually become pourable. We now also offer Venezuelan material.